SPF-CAMP-15A is rated 4.4 out of 5 by 45. Rated 5 out of 5 by BillG from Great tech service w unit that fixed problem First...I have to give credit to the very kind tech guy who spent a lot of time with me narrowing down the problem. He then recommended this unit to replace mine and as soon as I attached it, the cameras came back on the screen and my phone and iPad. Yes, this unit did, in fact, fix the video loss I suffered. My part was a few years old and he correctly advised me. I bought two so I can take care of a future video loss issue. I will also say that NightOwl will always be my camera monitoring company because they have real people who care, take time, and know their stuff. Nice job NightOwl. Lastly....the cost was not too high for the unit either. Rated 2 out of 5 by Steve Brooks from poor power adapter ruins a great system I bought my unit two and a half months ago but only hooked up three of the four cameras. I just recently hooked up number four and within a week lost all cameras.Tracked problem down to power cord and now can't get one. Very frustrated. Great system with poor power source. Rated 5 out of 5 by JimL from Just what I needed :-) An old plug, several years old, died and left me with 4 cams not working. NightOwl had a replacement plug to me in 4 days and with seconds all my cams are back online. Thanks again NightOwl, always the best service and support from you guys and girls!!! Rated 5 out of 5 by Wiredcat from Perfect fix These two power adapters were just what I needed to fix the problems I was having with my cameras. I think the picture is better than when the system was new. So happy. The service rep I talk with was very helpful. I'm sold on Night Owl. Rated 5 out of 5 by steven santana from grrr I had a friend that had this system installed in his home so I bought one because it was efficient and easy to use but had to leave before installing it due to deployment. Now its past the 1 year warranty and I found out that I don't have the splitter. Lesson learned. Rated 5 out of 5 by JoeS in Greer from Solved my problem I had a four way splitter go bad. The tech rep walked me through the test and we found that it was indeed the splitter. Four days later I had the replacement and I am back to having all of my cameras working. Great service and a good price. Rated 2 out of 5 by diaarn from Had the original and ordered 2 now I had damage to my house and did not get all hooked up as soon as I should have. When I did, second piece slipped out of socket and no return. Ordered 2 new ones, and both hooked until I unconnected and they broke. Have no choice I guess but to order another as I have 8 cameras and now 4 are not working due to this problem.. After this will sell my cameras and try an new company. No. The DVR and cameras have different power requirements. Please visit our support site at NightOwlSP.com and refer to your model's specifications to determine which power adapter you will need for your DVR. Thank you for choosing Night Owl! Unfortunately, no we do not see an extension for the splitter itself. The power adapter can be extended with a power extension cord as it is a standard adapter. But the splitter is a set length. Thank you for choosing Night Owl! I bought 4 cameras but only connect 3. After about a week the TV monitor goes black/blank when all three camera's are connect. If I disconnect one from the power supply then they other two will work. But if I connect all 3, the screen goes back to blank. Please contact our 24/7 technical support center at 1-866-390-1303 to troubleshoot this issue. One of our agents will be happy to assist you. Thanks for choosing Night Owl! I have 8 camera which 4 black out at dark, your team claimed it&rsquo;s a night vision module, so do I need 2of these to replace 8. If the cameras are all working fine during the day, but not at night, then this is most certainly a power issue. When the cameras switch to Night Vision, they require an additional power draw to power on the LEDs. This adapter/splitter combo, will power up to 4 cameras. I would recommend our 5amp adapter to provide additional power. See link below. http://nightowlsp.com/products/cables-accessories/spare-parts/spf-advr-12v5a.html Thank you for choosing Night Owl! No. The 1.5A adapter will not provide enough power to 8 cameras plus DVR. 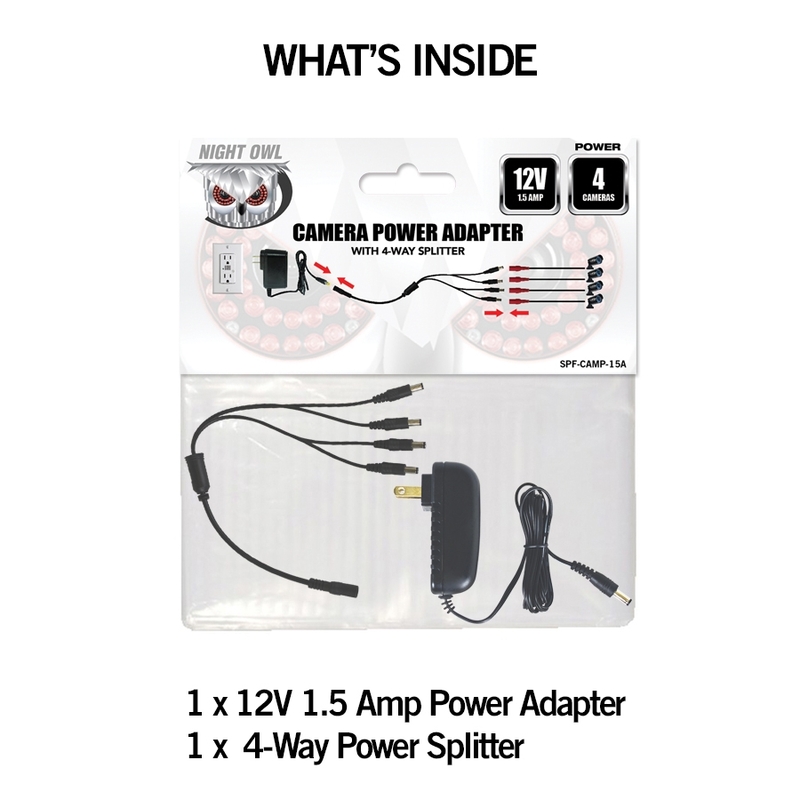 This adapter can only power up to 4 cameras. Thank you for choosing Night Owl! Please contact our free technical support team at 1-866-390-1303. One of our agents will be happy to troubleshoot the issue with you. Thank you for choosing Night Owl! Good Afternoon, No. If your system is a 4 channel system, then 4 is the maximum number of cameras you can have connected to it. Thanks for choosing Night Owl! Will the 12v adaptor and 4way splitter work for the model F6-DVR8-1TB? Hello, Yes, our 12V adapter will work perfectly with your system. Thanks for choosing Night Owl.